It's a long way to the beach at Veneguera, but worth the journey if you don't mind driving down the long unmade road past banana and papaya plantations. Playa del Cura, "The Priest's Beach", has a beach of dark native sand which is open to the sea and so has proper waves, unlike some of the enclosed bays. The beach-front at Tauro is relatively undeveloped, though it does have a desalination plant providing water for the golf course just up the valley. 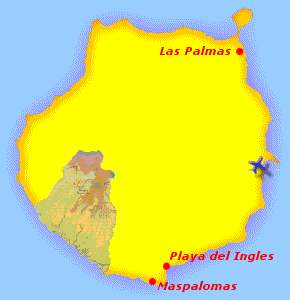 The old village of Playa Mogan is set on the cliffside overlooking Puerto Mogan, the resort built around the marina and fishing harbour. More recent development has taken place along the beachfront, stretching back up the valley. The main beach here is of imported golden sand and is sheltered by a man-made breakwater; next to it there is a rocky beach which has proper waves and an old stone jetty. The man-made "Lovers' Beach", with its imported white sand and beautiful blue water, is one of the most popular beaches in the area. Patalavaca is a resort linked to Arguineguín, many of whose hotels are built on the face of the cliff below the costa road, and so one enters many of them on the top floor. Patalavaca could be translated as "Cowleg", whether it means that or not we don't know! Basic information and statistics for the beaches can be found on the Catálogo de Playas website produced by the Ministerio de Medio Ambiente (Ministry of the Environment).